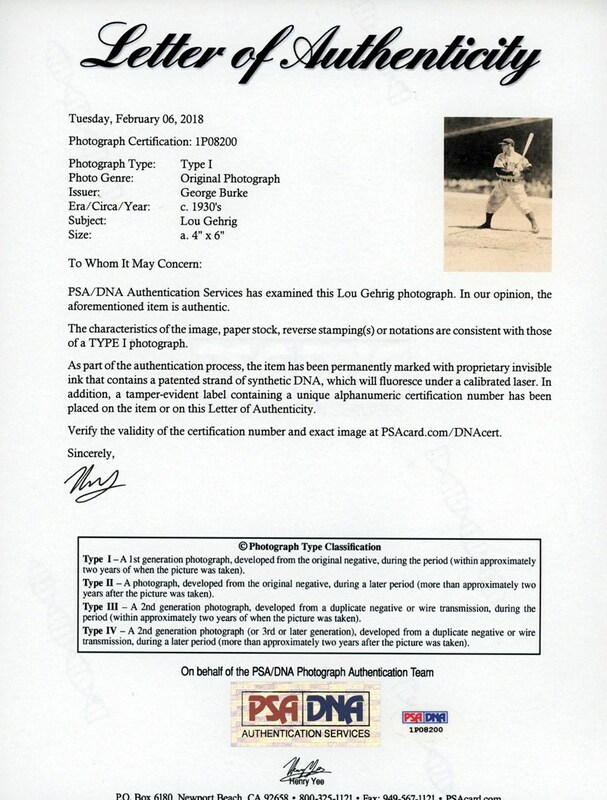 Presented here is an outstanding 1930's Lou Gehrig 4" x 6" George Burke Type I batting photo that stands as one of the most revered Gehrig photos in the hobby! 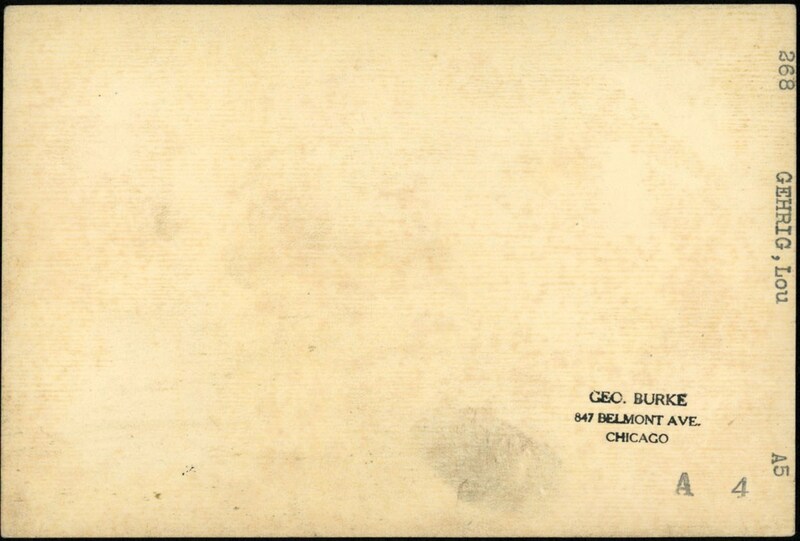 To clearly understand the magnitude of this museum worthy masterpiece, we feel it necessary to offer some general information with respect to the stature of George Burke and the history of some of baseball's renowned photographers. Baseball's iconic turn of the century photographer was, undoubtedly, the famous Carl Horner whose baseball portrait photos helped paved the way for a seemingly infinite number of cardboard images issued during baseball's dead-ball era. Following in his footsteps were legendary photographers such as Charles Conlon, Paul Thompson and George Grantham Bain, with their popular photos fetching in the neighborhood of five figures plus, in some instances. In the 1920's, a new flamboyant photographer by the name of George Burke began to "steal the show", and through the 1930's it was Burke who established himself as baseball's premier photographer. Simply stated, there are a number of Burke photos that are so sanctified, they transcend time from the present state to a by-gone era preceding the greed and substance abuse currently ruling our National Pastime. One of those iconic Burke images photos is this classic Lou Gehrig image depicting the immortal Yankee legend in his classic batting pose that led to so many historic round trippers over the course of his spectacular 15-year career. 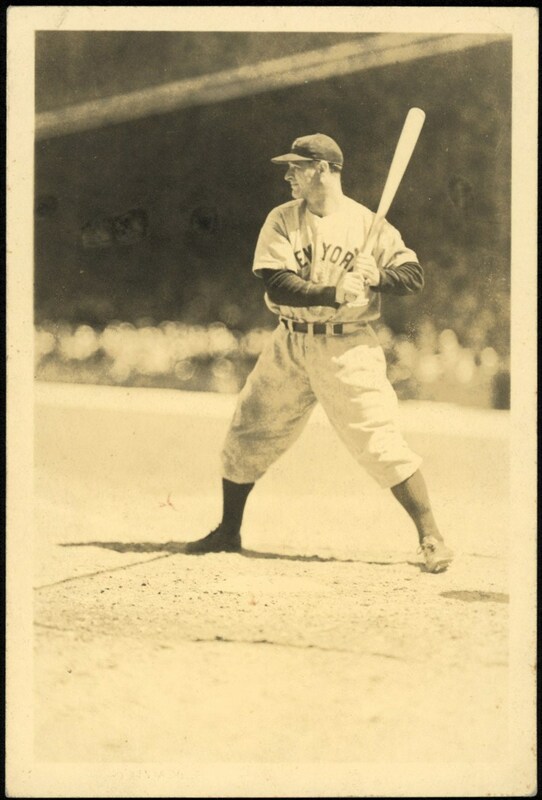 You can literally feel Gehrig's intensity as he is about to unleash his mighty swing, with the somewhat sepia-toned image portraying relatively clean surface and no obtrusive flaws.